does this also happen if you edit the wiki page's source (the other "edit" link)? Your wiki user account is not blocked. Okay, fine! 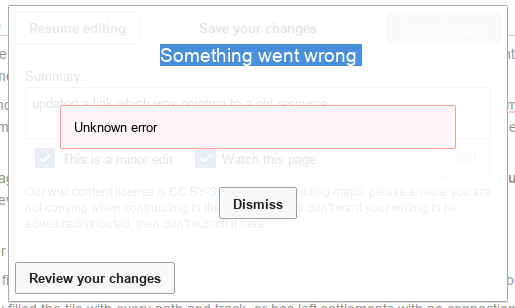 To find the root cause (and possibly fix some bug): Can you reproduce the problem with the visual editor? Does it happen on all pages? Can you try it in another browser (or even on another computer)? Have a look on https://wiki.openstreetmap.org/wiki/OpenStreetMap:VisualEditor (with a link to the settings in case you want to switch the editors permanently). I ran into this today too (slightly different error). Was using an up-to-date version of Google Chrome.